It was early Friday morning at Rainbow Park. Three Shih Tzus were taking a woman for a walk. Another woman was taking a baby in a stroller for a jog. I was standing on a little arched footbridge alongside a stout man sporting a salt-and-pepper goatee named Mike Bryant, who played baseball in the Red Sox’s organization and still holds the Massachusetts-Lowell career slugging percentage record of .689. The little arched footbridge was about 260 feet from home plate at Peccole Little League field No. 4. Kris Bryant, Mike Bryant’s son, smacked a baseball off the little footbridge on which his father and I were standing when Kris was 8. It seemed a long way for an 8-year-old to smack a baseball. 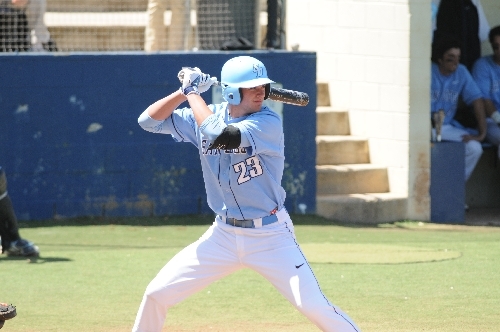 Kris Bryant is now a sophomore third baseman at the University of San Diego, which is 36-11 and ranked No. 19 in the nation. Asked if there was a seminal moment when he thought he might become a pretty good ballplayer, he said yes, smacking a ball off the little footbridge when he was 8. Mike Bryant would take buckets of baseballs out to those Little League fields when nobody was using them and pitch to Kris and his older brother, Nick. After a bucket apiece, the boys would get tired of swinging. OK, Mike would say. First one who goes yard gets $100. A few days after Kris padded his allowance by hitting a ball off the little arched footbridge, he hit one off the scoreboard in a game. On Thursday, in a West Coast Conference game at Brigham Young, Kris hit his 11th home run of the season and drove in four runs. On Friday, he hit two more homers, went 4-for-5 and drove in three. He did not homer on Saturday when the Toreros completed the sweep, but he did get two more hits to improve his batting average to .373, with 13 homers and 51 RBIs. This summer, the 6-foot-5-inch, 220-pound slugger from Bonanza High will play in Cuba and in the Netherlands with the USA Baseball national team. Next summer, when he’s eligible to be drafted again, Kris will make a huge pile of cash as a projected top-10 pick. I remember vividly a game in Los Angeles in 1978 when Kingman, then of the Cubs, hit three bombs, the last of which touched off an infamous Tommy Lasorda meltdown captured on tape. The Dodgers’ manager was blankety-blank upset by Kingman’s blankety-blank display of power and promised that if Doug Rau or Rick Rhoden ever threw another blankety-blank fastball to the man they called “Kong,” they’d find themselves back in Albuquerque pitching for the blankety-blank Dukes. You won’t hear WCC coaches use the blankety-blank words about Bryant, partly because the WCC is comprised of religious schools, and partly because Bryant is such a nice kid even the opposition admires him. This is a young man who received straight As during his entire academic career at Bonanza save for one “B” – an 89.2 in calculus when an “A” was 90. He was going to be salutatorian of his class until he learned how badly a female classmate wanted it and stepped aside; he visits sick kids in hospitals; he is polite to a fault; when he borrows the car, he always returns it with a full tank of gas. He reminds one of Chip Hilton, the values-driven protagonist of a series of sports books geared to young boys written by Clair Bee, the Hall of Fame basketball coach. It wouldn’t surprise me if Bryant’s pals were named Biggie, Soapy, Speed and Fireball. When I began our chat by saying it was going pretty good for him, he said, yeah, the team was playing well. Mind you, this was just a day or two after he was selected to play for the national team against the Cubans. There’s a 40-second YouTube video that shows Bryant batting against Oklahoma as a freshman. It seems to be shot from near the Oklahoma dugout; you can hear baseball chatter from what I am assuming to be the Sooners’ bench players. Bryant takes a couple of pitches, then unfurls a Dave Kingman-type swing, only more compact. The bench chatter stops. There is a split second of silence, followed by a chorus of “ohhhhs.” Bryant and the catcher and the umpire and the entire USD bench crane their necks to follow the flight of the ball. It turned out to be a very loud and prodigious foul. But if Kris Bryant hits one like that down in Havana, the Castro brothers probably aren’t going to like it. Las Vegas Review-Journal sports columnist Ron Kantowski can be reached at rkantowski@ reviewjournal.com or 702-383-0352. Follow him on Twitter: @ronkantowski.